There are a few bikes that all the nerds that occupy the myriad of web forums agree on, bikes that are known by most experienced motorcyclists as dependable and well engineered. The VFR800F is one. Yeah it might have a bit of a 90s look to it (which I love), but the engine is based on an incredibly well engineered endurance bike with gears driving the camshafts. Gears! Most cars have some kind of elastic band driving the uneven rods that spin half the speed of the engine. Not the ‘F’. You get metal meshing gears. In all my time owning and being a total brain sponge nerd about various VFRs I have never heard of an engine failure. Awesome. Then Honda stuck a chain in there. Aah well. Better than a rubber band I suppose. I bought mine after hunting high and low, eventually tracking it down in a Police Rider’s garage. He never used it and it was still under a dust sheet. I knew I was taking it home in the van before I even got there and the achilles heel of the bike had been fixed, plus there were a plethora of well documented service receipts and oil filter box lids. Sorted. Akane was her name and she was indeed shiny and red. I kind of have a thing of naming vehicles based on their origin, so Akane being a Japanese lass she got a Japanese name. There was something in there about Akane being something to do with red in Japanese too but I can’t remember. Akane was really lovely; comfortable, stable, reliable , fast and shiny. All things good in bikes. I especially loved riding at speed on motorways at night. It was like being in a small fighter space ship warping past the behemoth trucks in a blur of green cockpit light with that weird muffled sensation from earplugs and helmet. Would do solo trips to Cornwall from London in two and a half hours and buzz up to Birmingham to see friends. Yep, I am one of those people that personify machines. Most of my vehicles have had names. It’s a good thing because you’ll feel guilty if you treat them badly and have something to talk to on long lonely journeys! 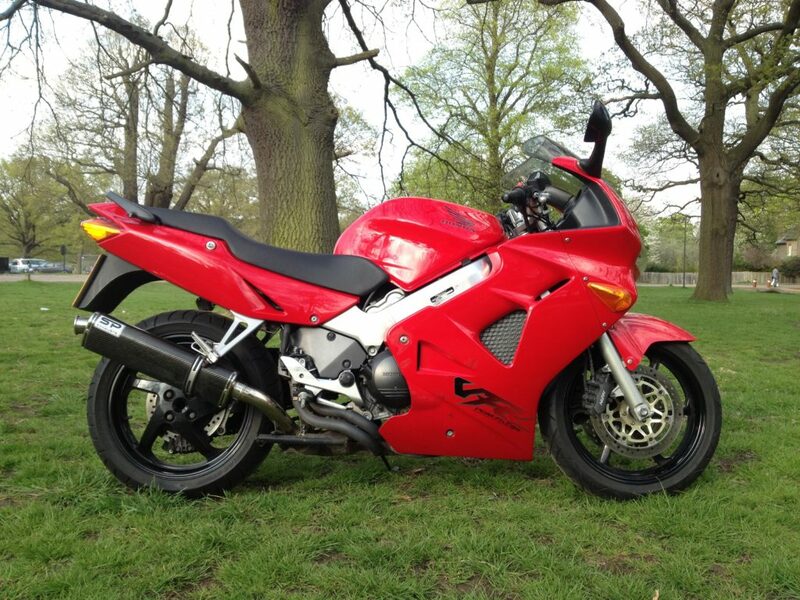 This entry was posted in Bikes, Motorbike. Bookmark the permalink.